Pre-Stretch film is a multi-layer stretch film that is made to be thinner and stronger than standard stretch film. This multi-layered stretch film has special characteristics that increase stretch resistance and strengthen load holding for transport. Ultimately, this produces less environmental waste since the operator consumes less material during usage. The high-performance pre-stretched film brings the benefits of the modern top of the range stretch wrapper to less advanced machines. Pre-stretch is strong, consistent and stable at a minimum effort of the worker. The cost of consumables is drastically reduced while increasing film coverage. We, at Tilak Polypack Pvt. 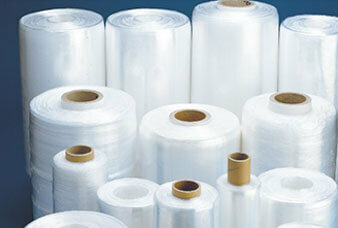 Ltd., are one of the leading manufacturers of Pre-Stretch Film. We are using machines imported from Europe to provide the best quality Pre-Stretch Film. Hand Use : 430 x 450 MM x 9 Micron x 500 Meter. 2 Paper Core ID. Machine Use : 430 x 450 MM x 9 Micron x 1500 Meter. 3 Paper Core ID. Other Sizes that can be made on request : 150MM, 200MM, 250MM, 300MM, 400MM, 500MM, 550MM.